The Cleveland Indians continue their postseason run this Friday at Progressive Field against the Toronto Blue Jays for Game 1 of the American League Championship Series. 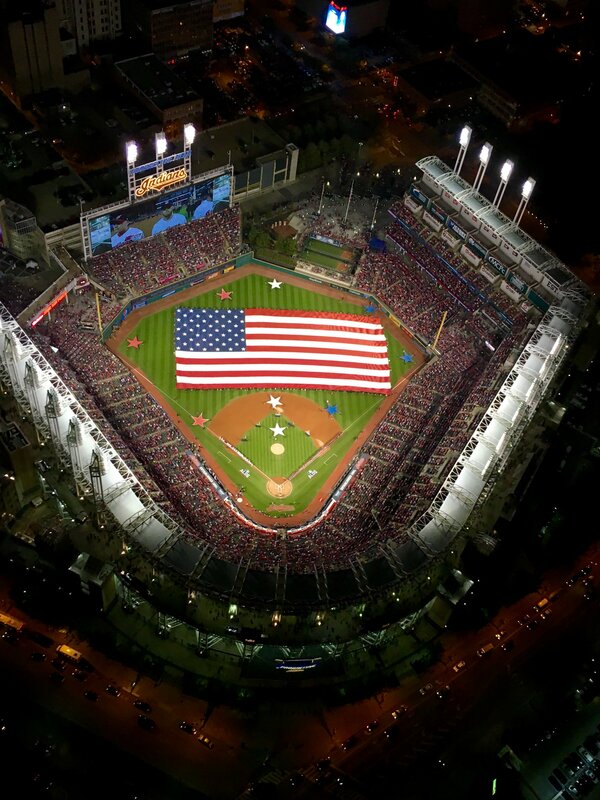 As Clevelanders and fans from all over the world cheer on our beloved Indians and begin to make their way to Cleveland the city, businesses, residents, and fans and ready to “Rally Together” to host Games 1 and 2. Prospect Avenue from Ontario Street to East14th Street. East 9th Street from Superior Avenue to Carnegie Avenue. East 4th Street from Huron Road to Prospect Avenue. In addition to Game 1 of the ALCS, the Cleveland Monsters will open their 2016-2017 season on Friday, October 14, 2016, at Quicken Loans Arena against the Rockford IceHogs at 7:00 pm with gates opening at 5:00 pm. The Monsters will be holding their Opening Weekend Championship Celebration, click here to see a list of the Monsters Championship festivities. Please be aware of this event and others if you are planning to be in the Downtown area. The City of Cleveland and Division of Police offer the following tips to make your experience more enjoyable. Presidential visit may cause delays on Friday morning. The President of the United States Barack Obama will be visiting Burke Lakefront Airport on Friday, October 14 at 8:30 am to hold a political rally. While the visit will be completed before Game 1 of ALCS, there will be some street closures that may cause traffic delays in the morning. View those street closures here. Be cautious of counterfeit tickets. As the Cleveland Indians advance further in the postseason, the risk of purchasing counterfeit tickets from individuals selling on the street increases. Fans who purchase tickets from a secondary source are taking a chance. Tickets for Games 1 and 2 of the American League Championship Series on Friday and Saturday are sold out, but purchasing from other sources besides Indians.com is done at the buyer’s risk. Arrive early, stay late. In order to ensure that you arrive at your destination without missing a second of the action, plan your commute beforehand and allow yourself extra travel time. There are plenty of great places to eat and enjoy the City of Cleveland nightlife after the game. Visit http://www.downtowncleveland.com/play for a list of options. Ride RTA. The Greater Cleveland Regional Transit Authority (RTA) is beefing up its service to fans coming Downtown Friday and Saturday for the American League Championship Series (ALCS), Cleveland Indians vs the Toronto Blue Jays. Each day, the Walkway from the Tower City Station opens four hours before the first pitch. Friday: 4 p.m. for the 8:08 p.m. game. Saturday: noon for the 4:08 p.m. game. Customers can be assured that the Blue, Green and Red lines will get you to the ballgame on time and will be there to get you home up to 60 minutes after the game ends — even if a baseball game goes into extra innings. RTA staff will be on hand to sell $5 Round-Trip Tickets at major stations. These passes help customers board more quickly, especially when the game ends. The Calder Cup champion Monsters open their season at Quicken Loans Arena. Game times are 7 p.m. Friday, Oct. 14, and 5 p.m. Saturday, Oct. 15. Fans can access the Q from the Tower City Station through the Walkway. Use RTA’s on-line trip planner, or Review the rail timetables, or Call the RTAnswerline, 216-621-9500.